While doing the South Beach Diet, I’m working very hard to make things that we all can enjoy and are healthy. This miso salmon is one of my favorite recipes I’ve tried recently, and it’s easy and fast to boot, so it makes an great weeknight dish. The fish is marinated in miso, mirin, rice vinegar, soy sauce, sesame oil, ginger, and scallions, and quickly grilled. You can make this with either skinless or skin-on salmon steaks. Serve the salmon as whole steaks or sliced on top of a bed of greens, either way you’ll have a quick, tasty, and healthy meal. We enjoy grilling year round, but some days it really is too cold to cook outdoors, and for those times we use a grill pan on the cooktop. I recently tested a Scanpan Professional Grill Pan, and in fact made this salmon dish on the Scanpan. You can read my review of the Scanpan Professional Grill Pan. For this final week of celebrating the third anniversary of Andrea’s Recipes, I have one fabulous grill pan (right) just like the one in my review to give away, courtesy of Scanpan. To enter the contest, just leave a comment telling us about your favorite grilled food. Please make sure your email address is correct so I can contact you if you are the lucky winner. Apologies to my international readers, but the pan can only be shipped within the continental U.S. The contest closes at 9 pm EST on Thursday January 29, and Random.org will select the winner. Look for the announcement of the winner in this post soon after. UPDATE: Congratulations to Cristina, comment #28, the winner of the Scanpan grill pan! Thanks to everyone who entered. 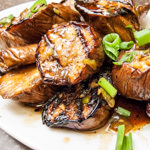 MARINADE: Whisk together the miso, mirin, vinegar, soy sauce, green onions, ginger, and sesame oil in a small bowl. Place the salmon in a baking dish or plastic bag, pour the marinade over, and turn to coat. Cover and marinate for 30 minutes in the refrigerator. GRILL: Heat grill pan to medium-high. Remove the fish from the marinade and season with salt and pepper. Grill the salmon, skin side down, until it is golden brown, about 3 to 4 minutes. Turn the salmon over and continue grilling for 3 to 4 minutes for medium doneness. Drizzle with a little yuzu or orange juice and serve. On a grill: Grill the salmon, skin side down, with the cover closed, until it is golden brown and a crust has formed, about 3 to 4 minutes. Turn the salmon over and continue grilling for 3 to 4 minutes for medium doneness. Happy Anniversary and thanks for another great giveaway. My family loves grilled steak and grilled salmon, but we only do it outdoors, when weather allows. I’d love to experiment with indoor grilling. yum, andrea! that recipe (and pan) looks fantastic. my favorite grilled food is veggies – especially zucchini and onions. oh, yum!! i love to have grilled pineapple! I love grilling thin, marinated carne asada for tacos! Mmmmmm, grilled Leg of Lamb. butterflied, marinated, grilled to Med-rare…. outside on the deck in the summer, sipping white wine or margaritas… served with cuke salad and fregula dusted with parmesan. This has been my birthday meal for the past few years. Now deep in the heart of winter, July birthdays seem so far away!!! The salmon sounds great! I have some in the freezer, and I’ll have to try this recipe out. My favorite thing to grill is veggies (eggplant, zucchini, mushrooms, asparagus, onions, or anything else I feel like experimenting with). Oh this is fabulous! Just what I need. I love to grill everything! So much so that in the wintertime, on those days too cold to grill outside, I’m kind of at a loss for how to make steak! Isn’t that funny? I think this grill pan would do the trick! I love grilled vegetables, with my favorite bring grilled asparagus. I usually baste it with a mixture of red wine vinegar, dijon mustard and olive oil before putting it on the grill. Delicious. I love grilled pineapple with other grilled veggies. happy anniversary!! 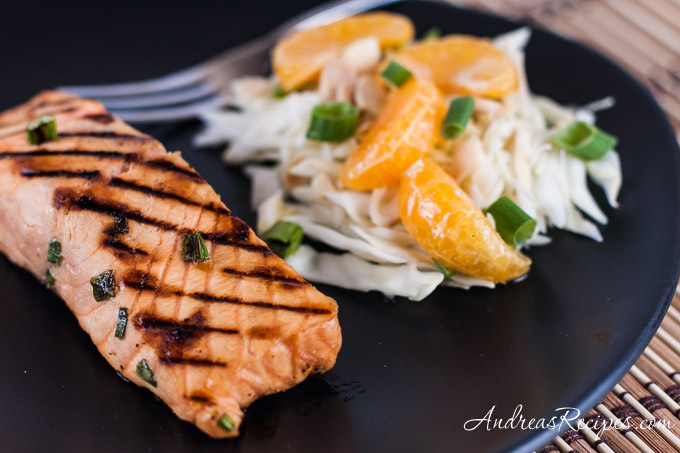 Andrea, I do like salmon on the grill and being an Oregonian have lots of access to fresh and delicious fish. However, almost every time my grill is lit a summer squash split and brushed with olive oil and sparingly salted and peppered will be on my plate. Especially fond of golden zucchini. Mmmm, that would be grilled mozzarella with tomato and avocado! I have so many favorite grilled foods. This one covers all the bases I think: a grilled beef filet topped with a grilled jumbo shrimp, grilled fresh jalapeno, and grilled tomatillo slices with a green peppercorn sauce, a squeeze of lime and a big slice of good pepper jack cheese melted over the top. Meat, seafood, vegetables and cheese all in one. I also love grilling, but since there are only two of us at home, it’s often a real pain to fire up the grill for such a small amount of food. My favorite things to grill are shish-kebabs (I make a yummy one with ham, pineapple, peppers and cherry tomatoes with a honey-mustard basting sauce) and flank steak (I marinate mine in a soy-ginger-orange marmalade marinade). But really, I’ll grill anything… it makes the food taste so much better! I love Steak especially with Grilled Asparagus! Mmmm that salmon looks great! We will definitely be trying that one. My favorite things to grill are steaks and chicken. Grilling reminds me so much of summer, so I also like to make cucumber and vinegar salad or a nice vegetable salad to complete the meal. Thanks for the giveaway…I just found your website! My favorite thing on the grill are all-american hamburgers! Favorite thing on the grill: any veggie and salmon like yours! Beautiful markings Andrea! We just grilled salmon outside last night–brr! I’d have to say, though, that my favorite grilled food is turkey burgers–and it would be great to avoid the frozen fingers of grilling outside only! Grilled cheese you can not beat! The salmon looks fab! THNX Andrea. Marinated chicken and vegetable kabobs. Wish I could grill year ’round (comfortably)! ok…finally one I can comment on…I love grilled burgers and dogs…nothing better. Love this pan too. I love to grill paninis! A very easy, tasty, and healthy meal! I like grilled chicken wings very much. Our Malaysian-spiced wings are a hit at parties. Okay, it’s a toss-up: grilled salmon, or grilled peaches, or grilled asparagus. Or all three together. I’m fortunate to have a grill on my covered porch, right outside the kitchen door, so we can grill year-round, even here in New England! I have a fabulous recipe for grilled pork chops which marinate in lemongrass, shallots, fish sauce, and garlic. Just writing about them makes me want some! Thanks for the great giveaway! What an awesome pan! Hi Andrea! My favorite grilled food is veggies that I use to make a sandwich with Italian bread and provolone cheese. Grilled mushroom is the best ! Boneless, skinless chicken breast, grilled and then finished with a honey/apricot/dijon glaze, served with grilled eightball zucchini. Ribeye or flat iron steak, with salt and pepper. No sauce necessary. I’d have to say lamb kabobs are my favorite grilled food, but I would love to use this to make grilled sandwiches. Thanks for the giveaway! I found you through Compliments of the Kitchen. Mmmm. I love maple and soy sauce marinated salmon. Marinate in 1:1 soy sauce and maple syrup for 30min – 1 hr depending on thickness of the salmon, grill, and you’ve got a great meal. I love to grill chicken breasts, salmon, shrimp,onions and fruits. Thanks for the giveaway!!!! My fav is filet mignon grilled. mmmm.. 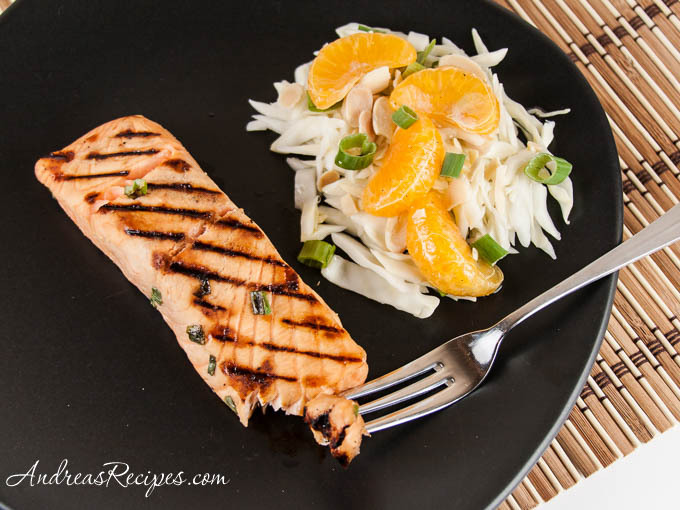 Your grilled salmon looks delicious! I want to grill now but it’s sleeting outside. I love grilled veggies withany kind of meat. I live your blog! I like grilled chicken because you can make so much with it. 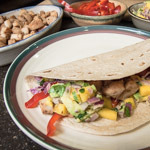 So many – grilled shrimp, salmon, chicken, stir-fry veggies on the grill, burgers. The list goes on. Please enter me. My favorite is grilled chicken with a crust of “cajun spices”. My husband grills salmon after he puts this spice rub on it he got from Williams Sonoma. It is to die for! I would sooo LOVE to have that indoor grill pan! My favorite thing to grill are panini sandwiches!! So many different ways to change them up! I love grilled salmon. It’s so wonderful and healthy. Really like any thick meaty fish griled, Tuna, Sword, Salmon, the miso salmon looks great. I’m a vegetarian, and I grill EVERYTHING. I’m not a HUGE recipe follower per se , but I grill veggies, Veggie Burgers, and for Hubby Salmon, and Tilapia. 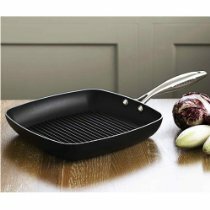 I would LOVE LOVE LOVE to win this Grill Pan! What a fantastic Gift! My family loves grilled Chicken and grilled panini. Thanks for a great giveaway! Happy Anniversary. I love to grill chicken and veggies (all kinds) I also like to do grilled sandwiches. Thanks. Great gift – nice way to share the fun of the anniversary. We like almost anything grilled but a real favorite around here is grilled corn. Grilling brings out flavor in corn that no other prep will. I think the only thing we haven’t tried grilling yet is pizza. Thanks for sharing a great recipe AND a fabulous gift. That looks delicious! My favorite grilled food would be some simple grilled shrimp and corn – Yum! I love grilled eggplant and grilled Meyer lemons. But I don’t have my own grillpan so this would be great! That looks delicious. I love grilled veggies like eggplant and peppers, but my husband’s families famous grilled ribs, mmm mmm good. I love grilled shrimp. Thanks for the chance. I love to grill. Our favorites are simple meat and vegetable kabobs as well as grilled veggie sandwiches. And I’ve recently been cooking with bison, and those make fabulous burgers on the grill. But it’s cold now, so that grill pan would be fabulous! Thanks for the giveaway! it’s so funny, i have been practically living off miso-marinated salmon for the last four weeks… well, i had it once a week, but still, there’s normally more variation than that in my diet. thing is, miso and salmon are a fantastic pair! i put mine under the broiler. i like your side of cabbage and clementines, i must try that! I love grilled chicken with grilled veggies, too. Thanks for the giveaway! First off, the grill marks on the salmon rock! MY fave thing to grill is Halloumi cheese. Grilling chunks of nectarines dipped in olive oil, salt and pepper. Hey! I love this grill and my favorite thing to grill is probably tempeh, or just simple veggies (peppers, onions, asparagus, mushrooms, and zucchini to name a few favorites!) I’m a vegan so I won’t be doing salmon but this recipe sounds intriguing and i might try it with tofu! =] I love miso! What a generous giveaway! I would love to make grilled vegetables — zucchini, peppper, eggplant, like we ate in Italy last summer. Tandoori chicken! Ah, what can more good than that!! We don’t eat much red meat anymore but steak remains my favorite grilled food. Fresh veggies are a very close second. Happy anniversary Andrea! Wow, I have been following for quite some time now, but didn’t think you had been blogging for so long! We have enjoyed grilled vegetables lately, with masala or curry, and loving it! Is it wrong to publicly admit that my favorite grilled food is grilled cheese? Then it’s chicken, burgers and pancakes. I love to grill chicken…steak…burgers…hot dogs…corn…potatoes…hmmm, many things! I love grilling….chicken, salmon, vegetables…so this grill would be wonderful. My favorite dish is grilled chicken. Thanks for the giveaway. I love to grill fresh sweet corn outdoors. Indoors I’d grill tofu! Great giveaway. I love to grill everything. I love all kinds of grilled foods, but my favorite would have to be grilled asparagas with a drizzle of olive oil, salt, pepper and a squeeze of lemon. Yum! An indoor grill pan would be perfect for grilling veggies since I have to use foil on the outdoor grill. No more lost veggies falling through the grill! Grilled red peppers! Especially incorporated into something like a soup or rice or whatever. Grilled steak…juicy, cooked medium with a big glass of red wine. Yummy. I can’t wait for grilling season! I have to say I love to grill bratwurst! Yummmy! With some delicious sourcrowt. I miss them so much in the winter. I like to grill small pizzas. I make my own dough and it can be rolled out super thin. I like to grill vegetables – sliced peppers, onions, pumpkins, fennels, and romaine (quartered). Drizzle some extra virgin olive oil, a little balsemic vinegar and black pepper and you’re good to go! How, how nice this recipe is! Can’t wait to try it! Love this site! I love to grill in the kitchen during the winter months almost every night. My favorite is grilled (prebaked) potatoes, asparagus and talipa, with a light butter and lemon spread on them! YUM!!!! Oh, looks like I made it just in time 🙂 Salmon is our favorite fish but I usually don’t grill it. That recipe looks really good though. My fave thing to grill is flank steak. Always turns out perfect! Good luck on the SBD! I’m on a similar healthy eating venture myself! Besides fish and seafood, I really love grilled veggies! All kind…onion, zuchini, tomato, eggplant etc. Happy Anniversary, thanks for the great giveaway. I would love to try grilling steaks indoors, the flavor of grilled with 10 inches of snow on the ground! Hey dear forgot to mention that I am a new here…infact just 3 months old on blogosphere. I love a great grilled burger! So what exactly is yuzu juice? yummmmmmy 🙂 i love paninis! Thanks to everyone who entered the giveaway. Entries are now closed. Check back in a day or two for the announcement of the winner!